Never worry about tension adjustments again. Enjoy perfectly balanced stitches regardless of the type of fabric you’re using. And, ATD lets you thread your loopers in any order. 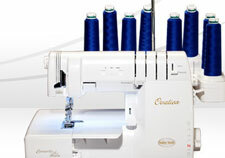 The Ovation gives you 87 stitch combinations to explore creative serging. From the tiniest rolled hem to the exclusive Wave Stitch, you’ll have many stitch options for every project.